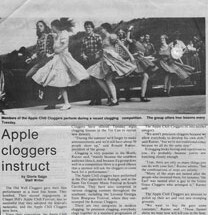 I’d first like to thank the current Apple Chill Cloggers for all of their efforts in finding all of us Alumni, and the hospitality we were shown at the recent reunion. For those of you who missed the 30th Anniversary celebration, it was absolutely incredible! 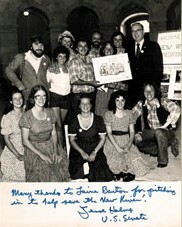 I danced from ’75-’78, during my undergraduate school years at NC State (yes, the “other” school). I had danced for three years in high school in Asheville with the Smoky Mountain Cloggers, which is where the Smokey I and II steps come from. As I recall, I joined a few weeks after the first Apple Chill performance, when I met Ron Raxter (of course) at Fiddler’s Grove. I stayed with it until I graduated and moved to the left coast for graduate school. Highlights that I remember include the performance at Jimmy Carter’s inaugural, the photo with Jesse Helms that many people still have from our performance in the Senate Office Building (first photo of me is from that), and the first overseas trip to the British Isles shown in Betsy Holbrook’s home videos from that era. 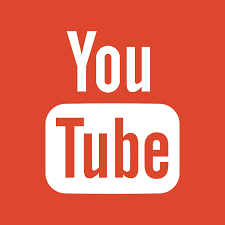 Professionally, I got my Master’s at U. California Berkeley, and PhD at Colorado State University, and I am now a Professor of Mechanical Engineering. I have been on the faculty at the University of Idaho in Moscow for 18 years now. On a personal note, as many of you know, my husband Tom and I lost everything in a wildfire in summer ’03 that took out five homes. I lost all my memorabilia, costumes, T-shirts (I still had the one that Ivan Mann had made for those of us who went on the British Isles trip…) and of course I lost all of my pictures. Some of you have sent photos and scans of clippings, for which I am extremely thankful. If any others of you have photos you could send of that era, I would be most grateful. 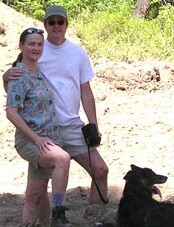 The recent photo is of me, Tom, and our old dog Taz. We are standing in the excavation where we are building a new home.